Review of Allison - "ATTACKED ON ALL SIDES: The Civil War Battle of Decatur, Georgia, the Untold Story of the Battle of Atlanta"
Of the series of battles fought in North Georgia during the critical summer of 1864, the July 22 fighting was the bloodiest and arguably the most dramatic of the entire campaign. There's a reason the events of that day came to be known as the Battle of Atlanta. With the epic confrontation on and around Bald Hill appropriately dominating modern descriptions and interpretations of the battle, the much smaller and far less significant same-day engagement fought a short distance to the east at Decatur has received comparatively little attention. Though appropriately linking Decatur and Bald Hill, the new standard history of the July 22 battle, Gary Ecelbarger's The Day Dixie Died: The Battle of Atlanta, devotes less than a handful of pages to the former, a small cavalry versus infantry showdown on the far right flank of General Hood's audacious swing around the southern end of General Sherman's converging army group. 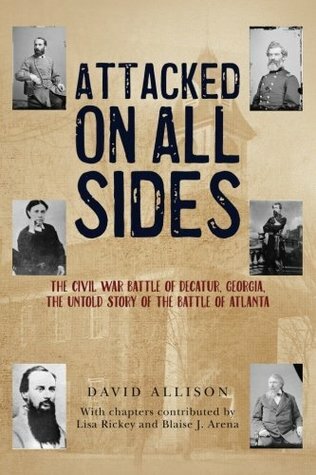 David Allison's Attacked On All Sides: The Civil War Battle of Decatur, Georgia, the Untold Story of the Battle of Atlanta gives Decatur its first full-length treatment and appreciation. The book begins with a hefty background section. 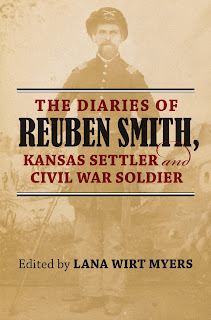 In addition to broadly tracing army movements leading up to the battle and describing at some length the Decatur town layout and environs, the author offers brief biographical sketches of major figures involved in the battle (with a strong focus on those that authored accounts of the action) and the units that fought there. As is often the case, the small size of the Decatur battle allows space in the text for more extensive profiles of the regiments and batteries engaged. Though supported by a small cavalry detachment and reinforced late, the Union defense of Decatur in the main consisted of only a single infantry brigade (63rd Ohio, 25th Wisconsin, 35th New Jersey, the Chicago Board of Trade Battery, and a section of Michigan guns) commanded by Colonel John W. Sprague [Second Brigade, Fourth Division, Sixteenth Corps]. The attacking force consisted of a large part of Joseph Wheeler's Confederate cavalry, this mounted host significantly outnumbering Sprague's infantry in the fight. The rich prize at Decatur was the estimated 1,600 wagons composing the entirety of the Army of the Tennessee's ordnance and supply trains. In its integration of numerous published and unpublished firsthand military and civilian accounts, the informational content of Allison's battle narrative impresses. A more seasoned practitioner might have weaved the primary source material together with less repetition, but the high level of granular detail provided by Allison in regard to unit positions, tactical movements, and their relationships to established landmarks throughout the estimated three hours of fighting allows the reader to follow the course of the battle with a reasonable degree of understanding. There are some unfortunate missteps along the way. Though a pair of maps depicting the town layout at different scales is included, the author commits the cardinal sin of publishing a battle book without a battle map of any kind. The general course of the fighting is readily extracted from the text, but some finer points are easily lost without map guidance. On another presentational note, while the study is extensively annotated the author's common practice of further interjecting bracketed editor's notes into the main text is frequently and unnecessarily distracting. In convincing fashion, Allison does not try to prop up the historical significance of the Decatur engagement, nor does he exaggerate any of the proposed 'lost opportunity' elements of the battle. Though the author justly compliments Wheeler's execution of his dismounted cavalry attack while also crediting Sprague for conducting an able defense of the town, the numerical disparity, though great, was not overwhelming. Even heavily outnumbered Civil War infantry typically did well fighting enemy cavalry, and this fact combined with powerful Union artillery support and subsequent reinforcement meant that Wheeler's chances for sweeping aside Sprague and destroying the vast Union wagon train were much slimmer than they might have appeared at first glance. After Wheeler pushed the blue defenders through and beyond the town, he was directed to break off his own attack and join General Hardee's struggling main assault off to the west. While some have observed that this was a grave mistake that might have saved a large part of the Army of the Tennessee's transportation from destruction, Allison, like others have also suggested, is likely more correct in determining that Wheeler would have found much more than be bargained for north of Decatur if his assault had been continued. The book also devotes a great deal of attention to the aftermath of the battle. As was the case with the battle itself, Union press accounts and sources regarding casualties are more numerous than their Confederate counterparts and more complete. A large percentage of Union losses were in prisoners (though not great enough to indicate any kind of general rout), and Allison also explores connections between these men and both the infamous Andersonville prison and the Sultana maritime disaster. Allison also extends his biographical profiles begun earlier in the study into the post-battle and postwar periods. With the help of Lisa Rickey and Blaise Arena, the book devotes special attention to the lives of three Battle of Decatur participants (Howard Forrer and Solomon Spitler of the 63rd Ohio, and John Fleming of the Chicago Board of Trade Battery). All three chapters are worthwhile reading, but Rickey's lengthy and extensively researched recounting of Forrer's life and death is particularly noteworthy. Mostly in areas of format and presentation, David Allison's Attacked On All Sides possesses some of the quirks and foibles commonly found in self-publishing, but the study's overall quality and value greatly exceeds what we typically get from that source. 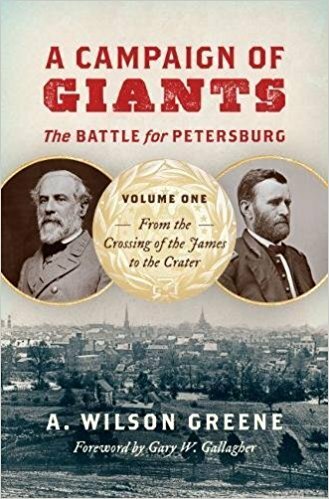 In addition to having significant local history appeal, the book, which explores the July 22 fight at Decatur at unprecedented depth, should grab the attention of students of the Atlanta Campaign as well. 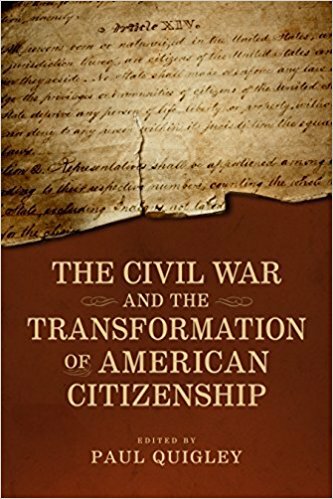 Before, during, and after the Civil War "the boundaries and consequences of what it meant to be a citizen remained in flux," and The Civil War and the Transformation of American Citizenship "offers a wide-ranging exploration of citizenship’s metamorphoses amid the extended crises of war and emancipation." In the wake of Confederate defeat major concerns arose over the citizenship rights and status of both white southerners and freedpeople. "As these changes swept across the nation, Americans debated the parameters of citizenship, the possibility of adopting or rejecting citizenship at will, and the relative importance of political privileges, economic opportunity, and cultural belonging. Ongoing inequities between races and genders, over the course of the Civil War and in the years that followed, further shaped these contentious debates." The Civil War and the Transformation of American Citizenship "reveals how war, Emancipation, and Reconstruction forced the country to rethink the concept of citizenship not only in legal and constitutional terms but also within the context of the lives of everyday Americans..."
Edited by Paul Quigley, the volume's nine essays examine diverse topics in three themed sections. "Race and the Redefinition of Citizenship" looks at emerging questions regarding the citizenship of freedmen and freedwomen as well as that of Chinese immigrants and American Indians. In "Oaths, Occupations, and the Wartime Boundaries of Citizenship," contributors study Confederate prisoners of war and the oath of allegiance as well as the nature of citizenship in occupied Winchester and Nashville. The final section, "Forging New Forms of Citizenship After 1865," discusses postwar dimensions of citizenship for three groups—black firemen in southern cities, southern expatriates in Latin America, and Confederate veterans in the Reconstruction South. I recently received LSU's Fall-Winter catalog and reviewer checklist. I wish every publisher could do this online. It just makes things so much simpler for all involved. Anyway, one of the most intriguing titles that I put on my list is Upon the Fields of Battle: Essays on the Military History of America's Civil War from contributing editors Andrew S. Bledsoe and Andrew F. Lang (November 2018). Bledsoe tweeted out some hints about what topics their book might cover a while back, and I've been wanted to get a look at the table of contents ever since. Happily, it just turned up online and is copied below. The guys recruited a solid lineup. The Looting and Bombardment of Fredericksburg: “Vile Spirits” or War Transformed? 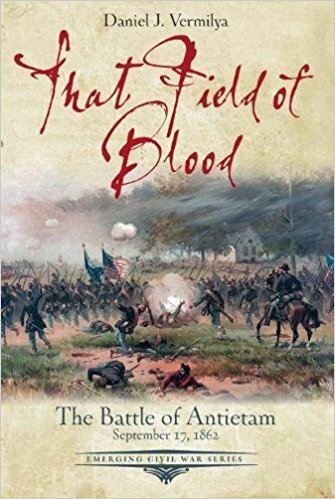 • That Field of Blood: The Battle of Antietam, September 17, 1862 by Daniel J. Vermilya (Savas Beatie, 2018). It seems like the Emerging Civil War series has been catching its breath for a while after a near constant stream of output (perhaps due to getting the crew's new Revolutionary War series up and running). But they are back now. GNMP ranger Dan Vermilya's That Field of Blood: The Battle of Antietam, September 17, 1862 (do you get ribbed by park service colleagues if you work at Gettysburg but write about Antietam?) 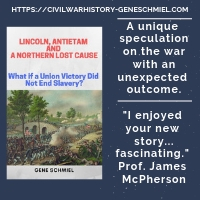 provides an overview of the entire campaign, beginning with the Confederate decision to move north into Maryland and ending with Lincoln's issuing of the preliminary Emancipation Proclamation. The book has all the elements of the series' now familiar format. There are 150 photos and illustrations, including six historical maps and one tour map. The battlefield tour has eight stops, all located on park grounds. The volume covers a lot of ground so there are only two appendix offerings this time around. The first briefly explores presidential visits to the battlefield from Lincoln to Carter, and the second provides a short history of the battlefield park. As with most other volumes, there are also orders of battle and a suggested reading summary. 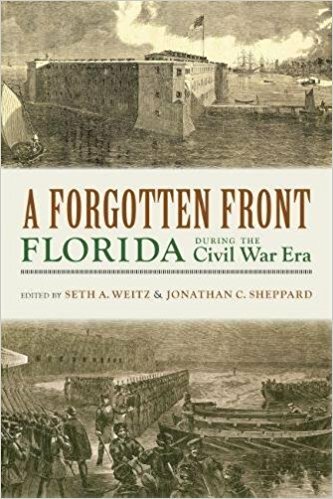 • A Forgotten Front: Florida during the Civil War Era edited by Seth A. Weitz and Jonathan C. Sheppard (Univ of Ala Press, 2018). This essay anthology had a place on my internal list of most anticipated titles of 2018. 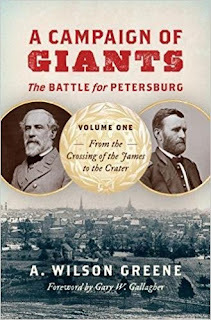 Civil War Florida is a far less neglected topic today than ever before, but it certainly remains a bit of a scholarly backwater so those responsible for this title can be forgiven for still calling the state "a forgotten front" of the Civil War. A Forgotten Front: Florida during the Civil War Era, edited by Seth Weitz and Jonathan Sheppard, is comprised of ten essays. From the description: "Although it was the third state to secede, Florida’s small population and meager industrial resources made the state of little strategic importance. Because it was the site of only one major battle, it has, with a few exceptions, been overlooked within the field of Civil War studies. During the Civil War, more than fifteen thousand Floridians served the Confederacy, a third of which were lost to combat and disease. The Union also drew the service of another twelve hundred white Floridians and more than a thousand free blacks and escaped slaves. Florida had more than eight thousand miles of coastline to defend, and eventually found itself with Confederates holding the interior and Federals occupying the coasts—a tenuous state of affairs for all. Florida’s substantial Hispanic and Catholic populations shaped wartime history in ways unique from many other states. Florida also served as a valuable supplier of cattle, salt, cotton, and other items to the blockaded South." Taken together, the essays in this book serve as a useful overview of many important aspects of Florida's Civil War on and off the battlefield. The first three chapters explore Florida's antebellum history. Two contributions focus on military affairs, one reviewing the Confederate defense and Union capture of Amelia Island and the other offering an overview of the guerrilla conflict in the state. Another chapter profiles Florida governor John Milton, who couldn't cope with Confederate defeat and took his own life in April 1865. Other essays "look at the politics of war, beginning with the decade prior to the outbreak of the war through secession and wartime leadership and examine the period through the lenses of race, slavery, women, religion, ethnicity, and historical memory." 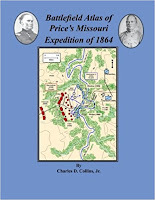 Another edition of "Battlefield Atlas of Price's Missouri Expedition of 1864"
I wish there were more new releases to talk about but May has been a complete bust so far, though I did get a couple of June titles early. So we'll get to some more book news instead. About a year ago I mentioned the U.S. Army's Combat Studies Institute's print publication of Charles Collins's promising-looking atlas of the 1864 Confederate expedition into Missouri, which was previously only available in digital form. 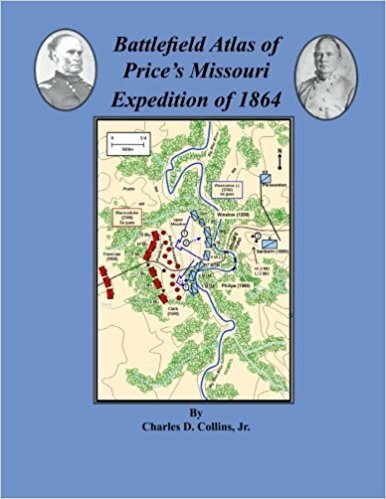 Now there's a new print version of Battlefield Atlas of Price's Missouri Expedition of 1864 priced at around half that of the original. Both editions are oversized paperbacks, but if you were turned off earlier by the cost now might be a good time to pick up a copy. The new one has a much more aesthetically pleasing cover, too. When it comes to atlases, I don't know about you but I still wholly prefer paper to screen. 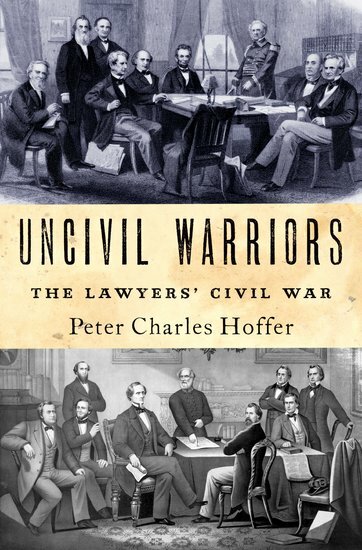 • Uncivil Warriors: The Lawyers' Civil War by Peter Hoffer (Oxford UP, 2018). I've often wondered if anyone was working on a Civil War book about lawyers in uniform, though I'm not sure what tack an author might take to might it most interesting. For the Civil War generation the law had always been viewed as the best profession for ambitious men wishing to both rise in society and realize their political aspirations at all levels, so it should surprise no one that lawyers and lawyer-politicians would be appointed generals and high-ranking regimental officers in both armies in vast numbers. But this book isn't about that! On a broader level, Peter Hoffer's Uncivil Warriors discusses the many ways that lawyers North and South shaped events from secession through Reconstruction. It comes to the conclusion that "the Civil War was 'of' and 'by' the lawyer/politicians who sat in seats of power." Thus, Hoffer's study "focuses on these lawyers' civil war: on the legal professionals who plotted the course of the war from seats of power, the scenes of battle, and the home front. Both the North and the South had their complement of lawyers, and Hoffer provides coverage of each side's leading lawyers. In positions of leadership, they struggled to make sense of the conflict, and in the course of that struggle, began to glimpse of new world of law. It was a law that empowered as well as limited government, a law that conferred personal dignity and rights on those who, at the war's beginning, could claim neither in law. Comprehensive in coverage, Uncivil Warriors' focus on the central of lawyers and the law in America's worst conflict will transform how we think about the Civil War itself." 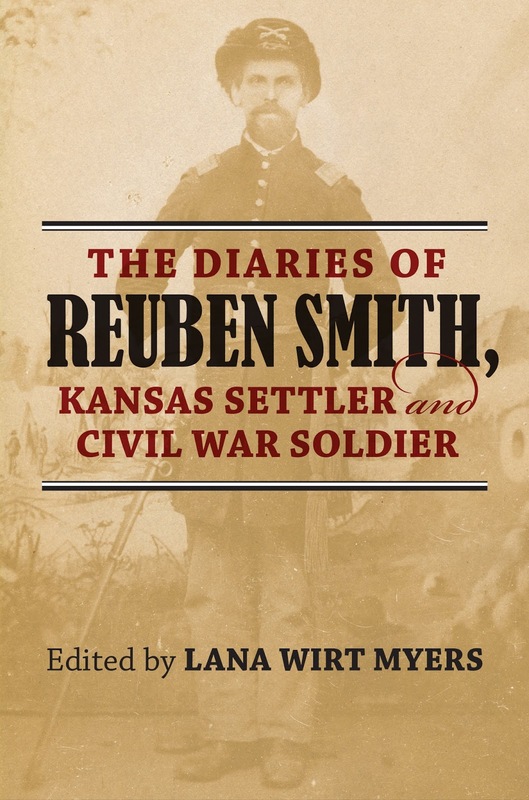 Chapters examine different views North and South regarding the legality of secession, contrast the Lincoln-Davis cabinets and US-Confederate Congresses, look at the Merryman case and its civil rights related offspring, debate the question of whether secession was a criminal act, and discuss the Emancipation Proclamation and subsequent amendment propositions. 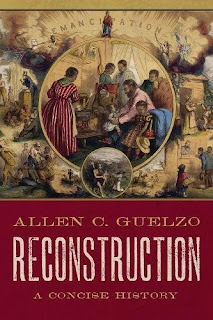 The book ends with a Reconstruction epilogue. 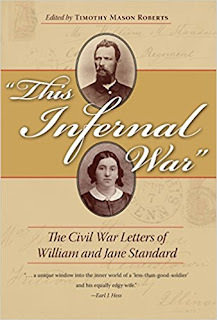 Author Q&A - Timothy Roberts and "'This Infernal War'": The Civil War Letters of William and Jane Standard"
Timothy Mason Roberts is a history professor at Western Illinois University and the author or editor of two studies focused on American exceptionalism. 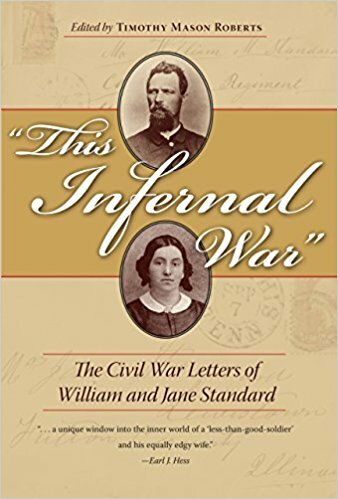 The recently published "This Infernal War": The Civil War Letters of William and Jane Standard (Kent State UP, 2018) is his first Civil War book project and is the subject of this interview. DW: Interpreting the nature of the "Copperhead" opposition in the North and assessing the threat these dissenters posed to the Union war effort still engenders a lot of healthy debate. The academic scholarship has certainly changed gears over time, with classic analysis from Frank Klement and much more recent work from Jennifer Weber occupying opposite poles. Where are your own views situated along this spectrum? TMR: I am closer to Weber to the extent evidence in this book reflects her claim that war resistance flamed across pockets of the rural North and deterred the war effort in those areas until 1864. I don’t think that Peace Democrats nearly took over the Democratic Party, as she argues. The Standards’ correspondence seems to confirm that the fall of Atlanta changed the minds of war skeptics especially from the Northwest, though they did not accept abolitionism. DW: Can you discuss a handful of titles that you feel are representative of the best scholarship on the northern opposition to the war? TMR: Mark Neely, Lincoln and the Democrats: the Politics of Opposition in the Civil War – Contrary to Weber, Neely diminishes the significance of Democratic war opposition. His focus on election outcomes of course is sensible, though his argument that the war’s setbacks, not emancipation, caused Republicans’ loss of seats in Congress in 1863 doesn’t work well in downstate Illinois. Matthew Gallman, Defining Duty in the Civil War: Personal Choice, Popular Culture, and the Union Home Front – A study of how war literature educated northerners on how to be good citizens through support for the war. This book sharpens the significance of the Standards’ more lowbrow dissent. Robert Sandow, Deserter Country: Civil War Opposition in the Pennsylvania Appalachians – A study of another rural northern area where antiwar dissent raged, though Sandow shows that dissent there was partly fueled by resentment of big lumber business, a force absent in rural Illinois at the time. DW: Briefly, who were William and Jane Standard? TMR: William was a 40-year-old former schoolteacher and county sheriff, elected as a Democrat, when he enlisted in 1862. Jane was 34. Both were southern migrants to Illinois. They had three adolescent children when William left home. Jane’s father was a Republican. DW: Did William Standard explicitly document in his writings his reasons for volunteering, and if so what were they? TMR: It’s not clear why he enlisted, though I theorize his motives in the book. DW: What were the chief sources of the Standards’s dissent and when did these antiwar attitudes emerge? TMR: William expressed frustration generally with military life, especially the military’s slow pay of his wages as a sergeant and his regiment’s tedious assignment through much of 1863 mainly to protect the supply and railroad lines of the Army of the Tennessee. Jane expressed surprise and dismay that he left her without adequately communicating about his various financial obligations. Both decried the Lincoln administration’s increasingly antislavery approach to the war, though William relished the license to plunder southerners’ homes as part of the evolving confiscation policy. DW: Did the Standards share their concerns (he with his comrades in the regiment and she with her neighbors), and if they did how were their objections received? TMR: William indicated that others in his company were sympathetic, though rarely above the rank of lieutenant. He noted many officers resigned early in 1863, intimating they did not support the Emancipation Proclamation. He remained in contact with a Democratic newspaper editor at home during the war. Jane was more of a loner. She visited and entertained the families of men with whom William served, but didn’t participate in antiwar activities, and resented local Republicans’ celebration of news of the army’s victories. DW: Did William ever seriously consider the ultimate act of opposition—desertion? TMR: Yes, and at Jane’s encouragement. But his musing about this possibility diminished once his unit saw action for the first time at Missionary Ridge and then made no mention again beginning with the Atlanta Campaign. DW: In the years following the end of the conflict, did the Standards remain unrepentant (for lack of a better word) in their antiwar stances? Was William proud of his service? TMR: It’s not clear what their postwar attitudes were, because the collection ends in 1865. I surmise they remained staunchly Democratic, though William more likely than Jane remained locally politically active. DW: Do you think it credible to argue that much of the public and private rhetoric employed by antiwar northerners (particularly when it came to race) is so offensive to modern sensibilities that it leads scholars to discredit the entire movement too readily (the result being a stifling of deeper and wider investigation)? TMR: Possibly. Civil War scholarship has sometimes conflated the North’s antislavery position during the war with racial enlightenment. The Lincoln film in 2012, I think, startled audiences not only for showing Lincoln as a politician but also for dramatizing how explicitly racist opposition was in the North even to immediately abolishing slavery, let alone establishing black civil rights. Historians of late seem to agree that the South seceded to protect slavery, more than to defend “states’ rights.” But it is less clear to me that many or most northerners both supported the war’s prosecution against the South and opposed slavery. DW: Finally, where would you like to see studies of northern home front opposition go from here? TMR: There seems a need to trace letter-writing and newspaper-circulating connections between “bad” soldiers like William Standard and kindred communities back home, to understand how opposition politics functioned and flourished in ways besides electoral contests. There are also opportunities for comparing antiwar areas of the North and the South to identify cross-sectional themes in dissent and in the war’s impact on families that rejected their respective governments’ demands for their patriotism. DW: Thank you for your time. This is another interesting (to me anyway) title from the Fall-Winter catalogs that are just coming out. Civil War archaeology book releases have never been a yearly thing, but we're due for another one. Borderland studies is a popular field at the moment and Civil War era events and personalities from both sides of the Rio Grande have also received renewed attention. Stepping into these fruitful arenas of study, Christopher L. Miller, Russell K. Skowronek, and Roseann Bacha-Garza adopt an uncommon approach with their upcoming book Blue and Gray on the Border: The Rio Grande Valley Civil War Trail (TAMU, December 2018), which will blend multiple historical genres and topics. In it they've "woven together the history and archaeology of the Lower Rio Grande Valley into a densely illustrated travel guide featuring important historical and military sites of the Civil War period. Blue and Gray on the Border integrates the sites, colorful personalities, cross-border conflicts, and intriguing historical vignettes that outline the story of the Civil War along the Texas-Mexico border. This resource-packed book will aid heritage travelers, students, and history buffs in their discovery of the rich history of the Civil War in the Rio Grande Valley." 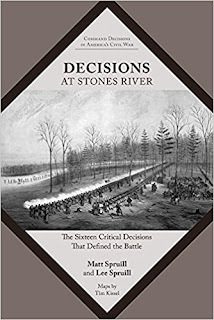 Review of Spruill & Spruill - "DECISIONS AT STONES RIVER: The Sixteen Critical Decisions That Defined the Battle"
New approaches to framing the study of Civil War campaigns and battles are always welcome. In this vein, University of Tennessee Press has recently launched a new series that will focus on the most "critical" high command decisions made by both sides and how those choices shaped the course of events before, during, and after major battles. With Decisions at Stones River: The Sixteen Critical Decisions That Defined the Battle and Decisions at Second Manassas: The Fourteen Critical Decisions That Defined the Battle, the first two volumes of the Command Decisions of America's Civil War series have now been released. Others covering both eastern and western theater battles are already in the works. In a necessary first step, Decisions at Stones River co-authors Matt and Lee Spruill firmly establish a hierarchy of decision-making and define for readers exactly what they mean by the term "critical decision." In the hierarchy, there are decisions, important decisions, and critical decisions. Only the last group is "of such magnitude that it shape(s) not only the events immediately following, but also the campaign or battle thereafter" (pg. xii). Several excellent narrative accounts of the Stones River battle exist in the literature so the differentiating emphasis in this book and the others in the series will be on why things occurred as they did, and to a more limited extent how things might have occurred differently if other choices had been made. Because the consequences of each decision must be "so great as to change the sequence and course of events" (pg. xiv), the authors wisely limit (with few exceptions) their examination to high-level decisions, those made by corps commanders and above in each army's leadership and command structure. In addition to being most sensible, this parameter should place a check on the popular temptation to blow out of all proportion the impact of more micro-scale tactical decisions. Because the unpredictable fortunes of war can render seemingly smart decisions disastrous (and vice versa), the authors also do well to avoid referring to particular choices as intrinsically "good" or "bad" ones. For Stones River and many other Civil War battles, one might reasonably question the existence of sixteen truly critical decisions, but the series will approach decision-making from a very broad perspective. In any given series volume, critical choices in the areas of strategy, operations, tactics, organization, logistics, and personnel might be addressed. In the case of Stones River, the sixteen critical decisions are slotted within three of those categories: organizational (2), operational (4), and tactical (10). At nine Confederate decisions versus seven Union, side balance is fairly even. In Decisions at Stones River, analysis of each critical decision follows a standard organizational format developed for the series. Discussion proceeds through five subheadings—Situation, Options, Decision, Result/Impact, and Alternate Decision/Scenario. The first and typically the lengthiest section, Situation describes the state of affairs at a crossroads moment in the campaign or battle. It provides readers with the background information necessary to recognize and evaluate the decision Options (two or three in number) that immediately follow. The historical Decision is then outlined very briefly before the Result/Impact section recounts what happened and how those events shaped the rest of the battle and perhaps beyond. The Situation and Result/Impact sections quite often reference other decisions in a meaningful way, further reminding readers of their interconnectedness and the cascading consequences of critical decisions made earlier. Not present for every decision, the optional Alternate Decision/Scenario section delves into alternative history conjecture based on choices not made. Three examples, one for each of the decision categories referenced above, should suffice to illustrate how the book works. The first is an organizational decision. With the problems caused by divided command structure during the 1862 Kentucky Campaign in mind, two options were available to President Davis for organizing Confederate forces in Middle Tennessee: (1) keep the Braxton Bragg and E.K. Smith commands separate or (2) consolidate their forces under the senior general. This particular decision points to a potential pitfall of the series, wherein one option is a clear no-brainer with the rest having little or no reasonable justification. On the face of it, this might preclude interesting and meaningful discussion. However, in this case the Spruills effectively use the consolidation decision (in conjunction with another high-level organizational decision to strip the army of one of its divisions) as a springboard for analyzing the reorganization of Bragg's army and demonstrating to readers the "far-reaching consequences" organizational decisions would have on the Stones River "plan of attack, scheme of maneuver, and allocation of combat power." As the book goes on to show, other critical choices would flow from and be limited by these very early ones. The second example is a three-option operational-level decision involving General Bragg's disposition and use of his available cavalry force of six brigades. The first option was for Bragg to send his two raiding brigades (under Nathan Bedford Forrest and John Hunt Morgan) immediately behind enemy lines to harass the the enemy and provide early warning of a federal advance. The second option would direct Forrest and Morgan to conduct deep raids against enemy supply lines in Kentucky and Tennessee. The third choice would involve keeping all the cavalry nearby for close tactical support. All options could be justified militarily, but Bragg selected the second one. Both deep raids caused significant material damage, but while Forrest played a role in forcing General Grant to pull back in northern Mississippi Morgan's actions had no inhibiting affect on General Rosecrans's ability to sustain his own advance in Middle Tennessee. Additionally, the impact and result of Bragg's critical decision left the Confederate army without the services of Forrest and Morgan's 5,600 horsemen at Stones River. This particular decision is also one of those with an attached "Alternate Decision and Scenario." It posits the benefits at that Bragg would surely have gained from keeping Forrest and Morgan nearby in close support, with any of several different tactical options having the potential to significantly alter the course of the Stones River battle. A critical tactical-level decision that confronted Union army commander William S. Rosecrans comprises our third and final example. Similar to First Bull Run, both armies at Stones River planned to attack the flank of the other. In this case, Bragg beat Rosecrans to the punch, leaving the federal commander to either continue with his original offensive plan (and hope to steal the initiative from the enemy) or go on the defensive to free up troops to confront any enemy breakthroughs that might occur (with different options related to how many men would be sent to shore up the Union center and right). Rosecrans chose the safest course, his defensive measures enabling the Army of the Cumberland to stabilize its position. Just as important, this early critical decision also made possible other critical choices down the line that would eventually lead to victory. The book also has a lengthy appendix section. In addition to army orders of battle, there's an extensive Stones River tour that focuses on the ten critical decisions made on the immediate battlefield. Similar to their treatment in the classic U.S. Army War College series of guidebooks, the tour stops in Decisions combine driving and walking orientation with author narrative and lengthy excerpts from firsthand accounts. Even if skipping the tour section, readers would be well advised to consult the tactical maps in the appendix, which are generally more detailed than those found in the main text. As the maps are directly tied to both critical decision situations and tour stops, the book's cartography is one of its great strengths. With Decisions at Stones River, the Command Decisions in America's Civil War series has gotten off to a very promising start. 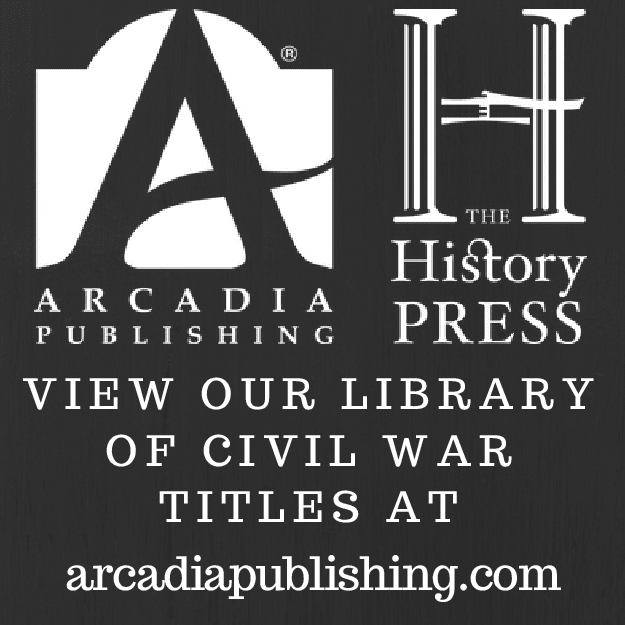 Civil War students, even those intimately familiar with the topic at hand, will appreciate the volume's fresh approach to thinking about Civil War campaigns and battles. The cavalry raids that played no small role in derailing Grant's first Vicksburg campaign in late 1862 continue to get coverage here and there, but decades on from Ed Bearss's classic trilogy there's really been no significant standalone work published on either Grant's overland march down the railroad line into northern Mississippi (which never resulted in any big battles) or Sherman's failed Chickasaw Bayou expedition. Even though I regularly look out for them, it's still easy to miss self and locally published history, and The Essential Guide to the Battle of Coffeeville, Mississippi - December 5, 1862 (2015) from Don Sides did escape my notice until now. Apparently, it was revised in 2016 and that is the version currently available. I have no idea if the book is any good. You can use the link provided and skim through the 'Look Inside' function yourself. Grant never did get the chance to firmly come to grips with Pemberton in North Mississippi. From the book description: "Before Grant could reach Pemberton his cavalry was stopped in a hard-fought clash at Coffeeville. This action threw Grant’s progress into neutral and provided time for the Rebs to regroup and plan a counter-strike. On the early morning of December 20 the Rebel cavalry struck Grant’s main Mississippi base in Holly Springs, ending the Mississippi Central Railroad campaign, forcing the Federals out of Mississippi to re-plan the Vicksburg Campaign. Learn what led to these battles, how the out-manned and out-gunned Confederates fought and won them, what effect it had on the Vicksburg Campaign, and how it was part of the High Tide of the Confederacy." Because I am interested in the topic, I plan to purchase the book and report back at some point. If you've read it, feel free to add your thoughts in the comment section. The accepted name of this battle seems to be on a continuous loop, from Palmito Ranch to Palmetto Ranch and back again. In the current literature, the two standard works on the subject are Phillip Thomas Tucker's The Final Fury: Palmito Ranch - The Last Battle of the Civil War (2001) and The Last Battle of the Civil War: Palmetto Ranch (2002) by Jeffrey Hunt, with most preferring the latter study (I think). Jody Edward Ginn and William Alexander McWhorter's Palmito Ranch: From Civil War Battlefield to National Historic Landmark (TAMU Press, September 2018) will have an added (perhaps primary) emphasis on site preservation and interpretation. In addition to offering "new information" about the battles, the book will "recount the initiative pursued by a multidisciplinary team organized largely through the efforts of the Texas Historical Commission to study, document, and preserve this important Texas historic site. Now, visitors to the area may benefit from not only improved and expanded historical markers, but also a radio transmitter and a viewing platform, along with other interpretive aids. All this is due to the campaign spearheaded by McWhorter, Ginn, and a cohort of dedicated volunteers and professionals." That's the way it works. No survey history of the war west of the Mississippi is penned since the end of the conflict itself and then suddenly we get two published within eighteen months of each other. My thoughts on Theater of a Separate War are unchanged (and it looks like Amazon is practically giving away copies at the moment for some reason), but others continue to see it in a much more positive light. This coming October, McFarland will publish Robert Laven's A Burned Land: The Trans-Mississippi in the Civil War (2018). The official description is pretty coy about the contents, but it does suggest that the actual focus will be much narrower than Cutrer's theater-wide treatment. While the title implies a comprehensive study, the estimated page count is rather slim at less than 150 and only Missouri and Kansas are mentioned in the description. The author is a retired Defense Department intelligence analyst and that perspective might color the analysis in different and interesting ways. 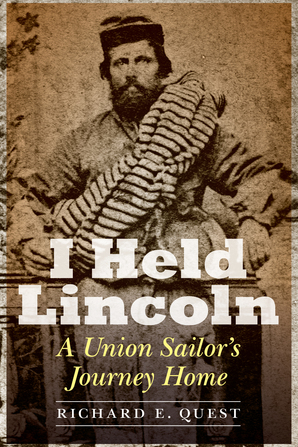 Richard Quest's I Held Lincoln: A Union Sailor's Journey Home builds a Civil War naval service, prison, and prison escape narrative around the personal log of Lt. Benjamin Loring. Though the book utilizes this and other historical sources to tell the story, it quickly becomes apparent when reading the text that there is poetic license involved as well. 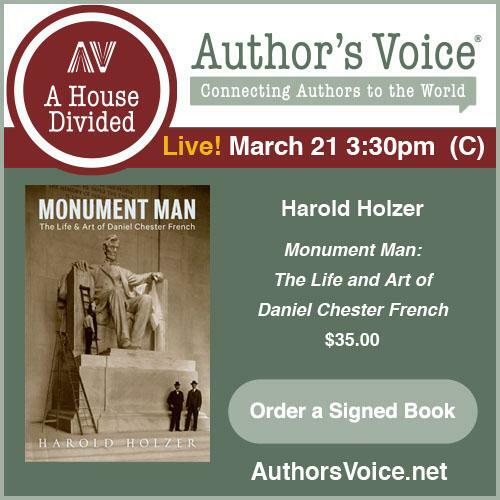 As stated in the Author's Note, many "conversations throughout the book are representations based on documents, letters, and oral family history." While the POW and escape experiences dominate the book, Loring's firsthand perspectives on lesser-known West Gulf naval events in and along NE Texas and SW Louisiana coastlines and inlets also might make for interesting reading. From the description: "Covering almost a year of Loring’s service, I Held Lincoln describes the lieutenant’s command of the gunboat USS Wave, the Battle of Calcasieu Pass, the surrender of his ship, and his capture by the Confederates. He was incarcerated in Camp Groce, a deadly Confederate prison where he endured horrific conditions and abuse. Loring attempted to escape, evading capture for ten days behind enemy lines, only to be recaptured just a few miles from freedom. After an arduous second escape, he finally reached the safety of Union lines and gained his freedom." Still suffering from his ordeal, Loring remained in the service and reported to the Washington Navy Yard for duty. As referred to in the title, he had one final brush with history before the war ended. "On the night of April 14, 1865, Loring attended Ford’s Theater and witnessed one of the single most tragic events in American history: the assassination of President Abraham Lincoln. After the shot rang out, Loring climbed into the presidential box and assisted the dying president, helping to carry him across the street to the Peterson House."